John H. Bigelow ~ Photography: The exotic and the commonplace. The exotic and the commonplace. 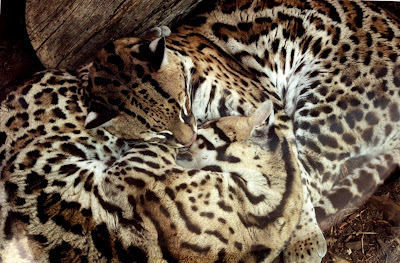 This pair of contented cats are Ocelots, native to our own southwest and Mexico. Talk about snuggling! 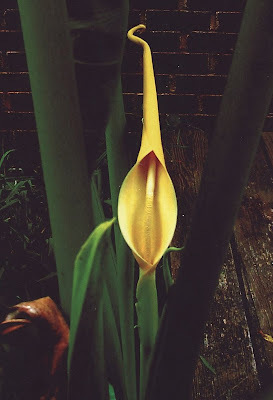 This strange,elfin looking, flower is the bloom an Elephant Ears plant and was, and still is, the only one I've ever seen. the blossom itself was almost a foot tall! No, it's not a honey bee. This is a Virescent Green Metallic Bee, a bee with a fairly wide range, and feeds on nectar, in this case that of a Trumpet Vine. I took this at the foot of Crowders mountain, N.C. This delicate, orchid like, blossom abounds in most of fields, and yards where it is generally considered a weed, unless of course you look closely. The individual blossoms, only 1/2 tall are a part of a cluster. The plant is called Henbit from its seeds which are eaten by chickens and is a member of the mint family. Sometimes great beauty comes in very small packages. When they were built to last. Remember when there was no color film? Ahhhh, at last a snow! Yes, they are found in the Carolinas!